Video You can embed Flash, Windows Media, Quicktime, and HTML5 files, as well as videos from your YouTube or Vimeo account. In addition, you can insert links to movies created in MadCap Mimic. Audio You can embed Windows Media audio files. 3D Models If you want to enhance your output using 3D, Flare supports Universal 3D (U3D) files. These files allow you to show users an interactive 3D model in print or web output. These elements are supported in online outputs, but in many cases they are also supported in PDF output (when viewing the PDF in electronic format). See below for more information about which elements or file types are supported in which output type. You can insert Flash, Windows Media, HTML5, or QuickTime movies directly into your Flare topics or snippets. See Inserting Movies. Embedded You can use the Insert > Multimedia option. When you use this option, the movie is embedded into the topic or snippet. In addition, you can specify advanced settings, such as whether to include controls with the movie (e.g., Play, Pause), whether to automatically start the movie when it displays, and audio levels. The options available depend on the type of movie you are inserting. Also, keep in mind that some movie formats may be supported in some outputs but not in others. Linked You can use the Insert > Hyperlink option. When you use this option, the user must click the text link in order to open the movie. Also, you can choose to display the movie in another window. Drag and Drop You can insert embedded movie files by dragging and dropping the movie file from the Content Explorer or File List window pane to the XML Editor. However, with this method, you can specify any necessary advanced settings only after the movie file is inserted (to do this, right-click on the inserted movie and select Edit Multimedia). Here is an example of an embedded MP4 movie that was created using the HTML5 movie output format in MadCap Mimic. Note: When you insert a movie from outside your project (using the Insert > Multimedia option), a copy of the file is added to your project. The file is stored by default in the Resources\Multimedia folder of the Content Explorer. If you store movies on YouTube or Vimeo, or if you use third-party movies from these providers in your content, you can add these videos to web-based outputs. Embedded You can use the Insert > Multimedia option. When you use this option, the movie is embedded into the topic or snippet. In addition, you can specify advanced settings, such as whether to automatically start the movie when it displays, and what kind of information to display on the movie (e.g., movie title, player branding). The options available depend on the type of movie you are inserting. Linked You can use the Insert > Hyperlink option. When you use this option, the user must click the text link in order to open the movie. When you insert a YouTube or Vimeo link in your output, it will send you to the host's website to play the movie. Here is an example of an embedded YouTube movie. Here is an example of an embedded Vimeo movie. 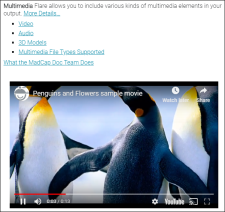 Note: When you insert a YouTube or Vimeo movie (using the Insert > Multimedia option), these movies are not stored in your Resources > Multimedia folder like other movie types, because Flare references them from the web. If you have MadCap Mimic installed, you can create videos to be displayed in the output format of your choice—HTML5, Mimic Movie Format (MMF), Microsoft Silverlight, or Adobe Flash. After creating a Mimic movie, you can insert a link to it. The movie will open and play in the appropriate window (e.g., movies generated in MMF are viewed in the MadCap Movie Viewer). After you insert a movie link, a small movie frame icon displays next to it. You can insert movie links into topics, tables of contents, or browse sequences. For more information see Inserting Mimic Movie Links in Topics, Inserting Mimic Movie Links in TOCs, and Inserting Mimic Movie Links in Browse Sequences. For more information not provided here—such as details on the different movie output formats—see the MadCap Mimic online Help. Note: When you insert a Mimic movie link, the appropriate movie files are not copied to your project's content files. Instead, they are automatically copied to the output files when you generate the target. You can insert Windows Media audio directly into your Flare topics or snippets. See Inserting Audio Files. Embedded You can use the Insert > Multimedia option. When you use this option, the audio is embedded into the topic or snippet. In addition, you can specify advanced settings, such as whether to include controls with the audio (e.g., Play, Pause), whether to automatically start the audio when the topic displays, and audio levels. Linked You can use the Insert > Hyperlink option. When you use this option, the user must click the text link in order to open the audio. Also, you can choose to play the audio in another window. Drag and Drop You can insert embedded audio files by dragging and dropping the audio file from the Content Explorer or File List window pane to the XML Editor. However, with this method, you can specify any necessary advanced settings only after the audio file is inserted (to do this, right-click on the inserted audio file and select Edit Multimedia). Note: Some browsers do not support certain audio types. This is because certain browsers do not support the plug-ins required to play these file types. Note: When you insert an audio file from outside your project (using the Insert > Multimedia option), a copy of the file is added to your project. The file is stored in the Content Explorer (Resources\Multimedia subfolder). You can insert 3D models directly into your Flare files. See Inserting 3D Models. Insert > Multimedia When you use this option, the 3D model is embedded into the topic or snippet. In addition, you can specify advanced settings, such as rendering mode, lighting options, and how to display the model when the output opens. Insert > Hyperlink When you use this option, the user must click the text link in order to open the 3D model. Also, you can choose to open the 3D model in another window. Drag and Drop You can also insert embedded 3D model files by dragging and dropping the file from the Content Explorer or File List window pane to the XML Editor. However, with this method, you can specify any necessary advanced settings only after the 3D model file is inserted (to do this, right-click on the inserted 3D model and select Edit Multimedia). Here is an example of a U3D file. Note: The U3D content above is displayed as an image file to ensure compatibility across all devices. Note: Some browsers do not support U3D files. This is because certain browsers do not support the plug-ins required to play this file type. Note: If you select a U3D file outside the project, that file is then copied and placed inside the project. 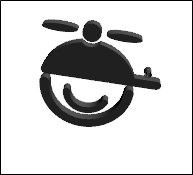 The U3D file is stored in the Resources\Multimedia folder of the Content Explorer. Warning: Due to issues with Windows Media, these files will not work in the compiled output if the link from the topic to the media file has ../ at the beginning (to read the Microsoft KB article, see http://support.microsoft.com/kb/819105). For example, let's say you have a topic at the root level of the Content Explorer and another topic that is in a folder you created. Suppose that each of these topics contains a link to a Windows Media file that is stored (by default) in the Resources/Multimedia folder in the Content Explorer. The file will work in the first topic but not in the second. The solution is to move either the topic or the multimedia file to fix the link. Therefore, you might decide to move the multimedia file into the folder where the topic is stored. Alternatively, you might move all topics that use multimedia into one folder. Then, you might place all multimedia files in that same folder or a subfolder within it. Note: When a PDF is opened, there is initially a blank area where the multimedia item was inserted. Also, a security message is shown, prompting the user to allow the video to load once or always. After clicking one of these options, the video loads.